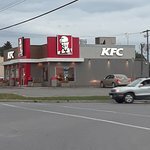 The KFC in Hawkesbury just completed renovations. The place looks great, but the food is bad. I ordered a 3 piece chicken dinner with a soft drink. The chicken was over cooked and extremely dry. The coating was very greasy and the French fries were cold. There was nothing redeemable about this meal. No problems - no fuss. Decent value for popcorn chicken and fries...but what made this meal absolutely outstanding was the sauces... They're not at all like the kind you get at any other franchise that I've visited, or in any in Montreal...the Garlic sauce was think, rich, and you could see small pieces inside before you opened up...they had many other exotic ones, mango, spicey... we asked for all of them, and everytime I visit relatives in this area I insist on going back to this KFD just to stock up on these sauces to dip the fries in ... :) Could it be that they're getting it from a different supply company?